discipline of the drivers of these taxis’ either. “I got into a terrifying accident last Wednesday while I was heading home on a PickMe after having dinner with my colleagues at The Station, Dehiwala. I was seating in the back and was asleep during the entire ride. I usually take the front seat, but only that day I decided to take the back seat because I was tired. 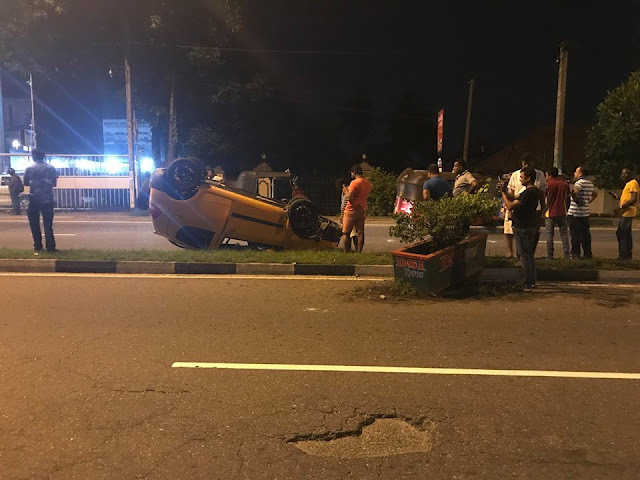 Suddenly, a weird braking sound made me wake up, and I saw my driver had lost control of the vehicle, then I shouted and held the roof of the car because I was not wearing a seat belt. The car hit a flower pot in the middle of the road hard and overturned to the other side of the road (fortunately, there were no vehicles). I opened the door and got out the car. People rushed into the scene quickly and took the driver out of the car. Luckily, both the driver and I had minor scratches only. The people who witnessed this told me that this fellow was driving recklessly but the driver was like he came at a controllable speed but the brakes did not work properly. 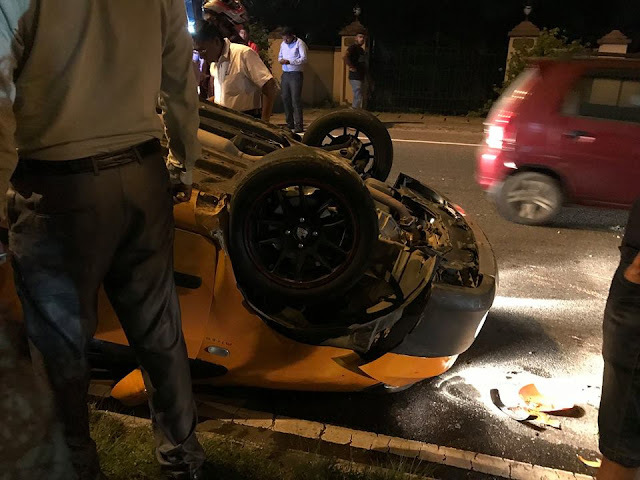 I was asleep, but one thing I am sure is that this fellow went at an uncontrollable speed otherwise this would not happen. 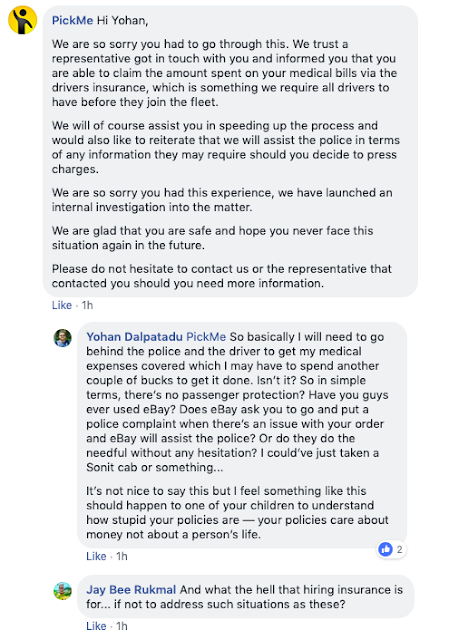 I contacted PickMe's 1331 hotline and informed them of the incident twice, and the call centre was like "Ah okay, we will inform the relevant department blah blah blah". 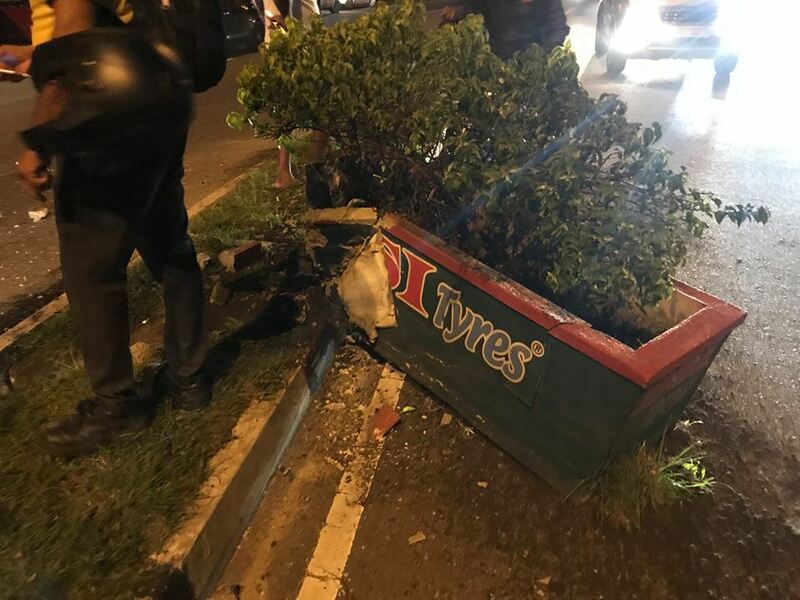 A policeman came to the scene, and he seemed to be a friend of this driver (based on his behaviour). He said he is from the Kadawatha police. My father came to the scene, and the policeman took my mobile number and was like I can go. “The next day, I again made a complaint via the app, and I received a call from PickMe questioning what happened, then I explained them the incident again. Moreover, I requested them to pay the expenses I had to make for the medical reports. The person was like "I'll inform this to our manager, and he will get back to you during the day". 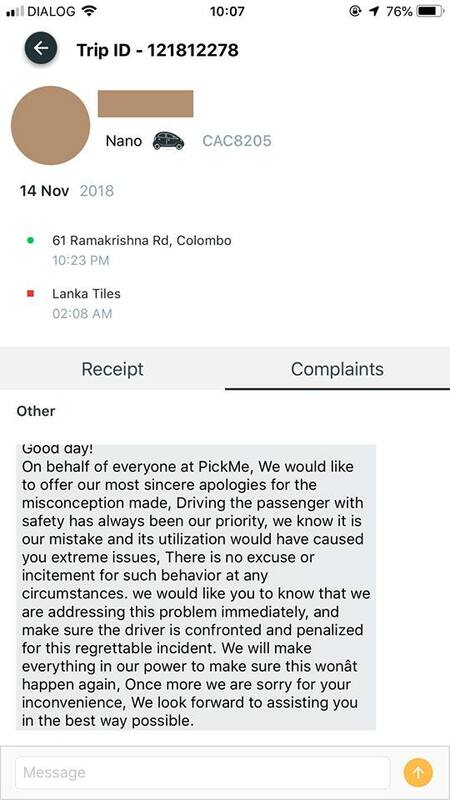 No one got back to me after that, and in the evening, I got a reply to my complaint via the app stating that PickMe will be addressing the issue immediately and will be taking necessary actions -- I am pretty sure that PickMe will not pay me the expenses. 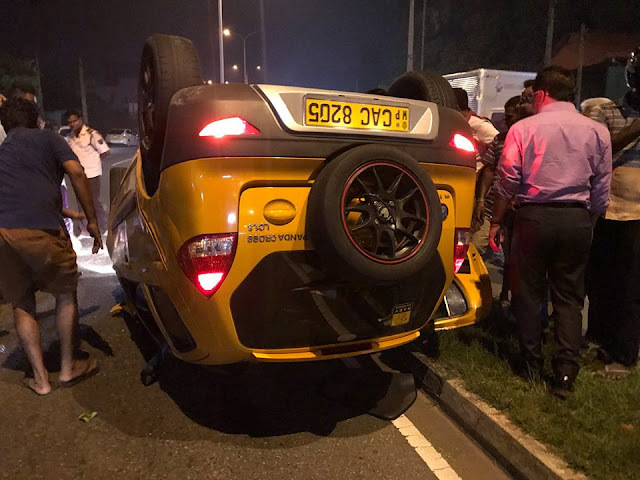 Anyway, the reason why I am posting this here today is to urge you all to be careful when you are taking a ride with any taxi-hailing app/provider. Especially DO NOT SLEEP. If you feel the driver is not listening to your instructions, stop the trip and take another. If something goes wrong, the app/provider will not take any responsibility. You will have to bear the loss,” the passenger, Mr. Dalpadatu had noted. During our investigations into this matter, we discovered that there is no institution in this country that one who faces such an incident, could seek help from. 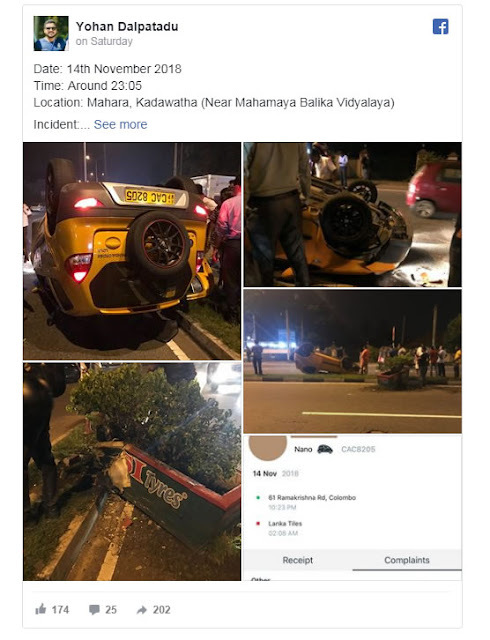 We inquired from the Chairman of the Consumer Rights National Organisation, Ranjith Withanage who said this was a grave situation. He said that this is not the first incident passengers of these taxi services have faced such issues and the situation is made more serious due to the fact that there is no authority in this country that could take action against such taxi service providers. He also noted that these taxi services are also engaged in obstructing the formation of such an institution.